We provide a complete range of hygienic valves which includes butterfly valves, actuators, control heads, shutter valves and many more. Different products demand different solutions. For example, products with large solids can’t pass through a butterfly valve but a ball valve is not and can never be, fully hygienic or cleanable without being disassembled. Our valves deliver a free flow of any product in production while providing cost savings through minimum downtime when cleaning the lines. Alongside the hygienic valves, we supply aseptic sampling valves, tank outlet valves, as well as, industrial valves which include ball valves, gate valves, check valves and many more. Working with partners such as Evoguard who use high grade and innovative technology to create the best conditions for the utmost quality. 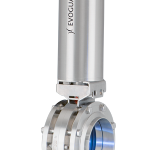 The Evoguard range of valves is a high quality, efficient component of the process system.